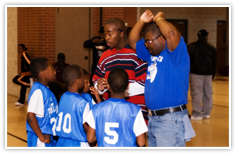 The basketball league is for boys and girls ages 5 to 12 years old that play and learn the game of basketball while building self-confidence and getting physically fit. The league has approximately 80 teams of boys and girls, averaging 10-12 players per team. Games are played on Friday evenings and Saturdays. Registration for students is in October and the season opens in January and ends in March. For parents whose children are new to the league, you are required to attend a player orientation, held the third week of October. During orientation, your child is registered and assigned to a team. The 30+ Hoops League is a draft basketball league for individuals (male and female) 30+ years of age with a mature basketball game. Each participant registers individually and gets drafted by team captains. Teams are balanced yet competitive with a focus on promoting Christian fellowship. A major component of the league is a weekly devotional (required prior to each game) that is based on the current series being taught at Oak Cliff Bible Fellowship by Senior Pastor, Dr. Tony Evans. OCBF Membership is not required to participate in the league. Individuals interested in coaching a basketball team, please download the forms listed below and complete the Coaching Application and Consent to Perform a Background Check. Email both forms to tblathletics@ocbfchurch.org. A TTA representative will contact you upon receiving your information.